Chinese crown orchid, photographed in western Delray Beach, Palm Beach County, in January 2016. 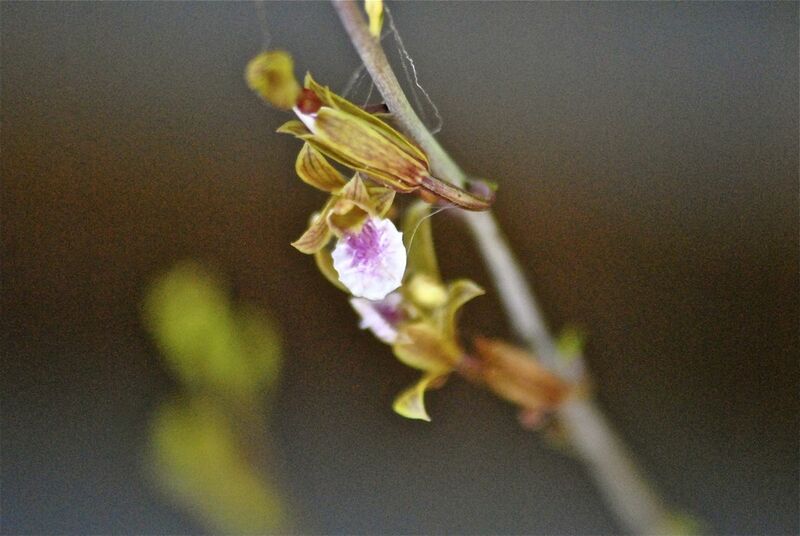 The next exotic plant to menace the wilds of Florida might be an orchid, of all things. This guy, Eulophia graminea, called by some the Chinese crown orchid. It is a native of tropical and subtropical parts of Asia, from Pakistan to India, Nepal, China, Southeast Asia and the Ryuku Islands of Japan. Somehow it made its way into the wilds of Florida, discovered growing in a few neighborhoods in Miami-Dade County in 2007. This plant is so new and so rare in the United States that most sources we checked don't have a common name for it. The U.S. Department of Agriculture's PLANTS database has almost no info on it. 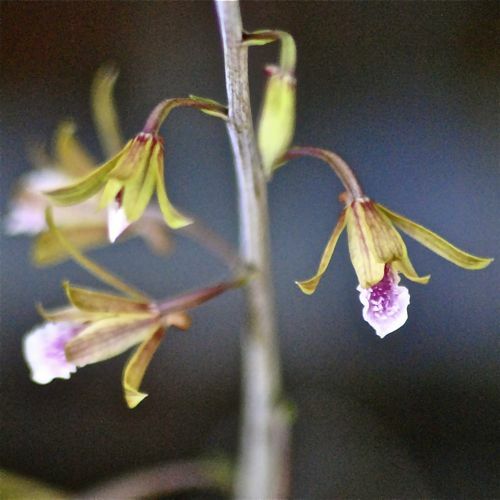 The North American Orchid Conservation Center offers two names: Chinese crown orchid and grass-leaved eulophia. The first thing to know is that it is a ground orchid. In its native range, it grows in a wide variety of open habitats, including grasslands and even beaches. In Florida, it was orginally found in places that had been mulched with wood chips, but has been seen growing in a wide range of habitats. It is a Franken-plant of sorts. 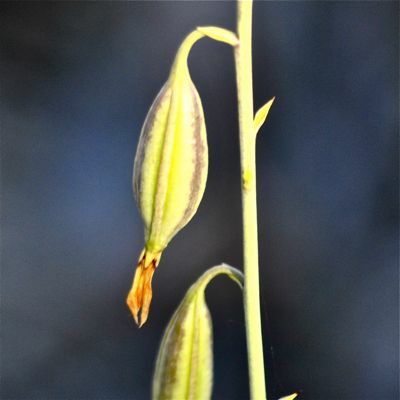 Its stem resembles the kind of bulb that might be found on a lily. 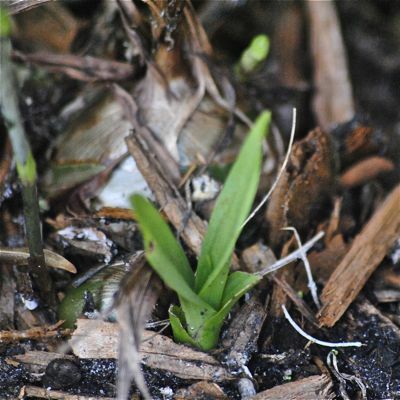 In fact, it's called a pseudobulb, and the first leaves to emerge from it are very much lily-like. From the stem, a single flower stalk, called an inflorescence shoots up as high as five feet, by some references, though the plants we've seen were much shorter. 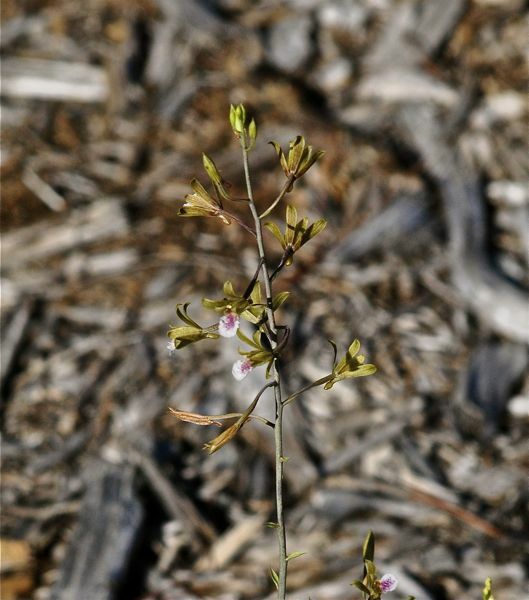 Along the stalk are small, tongue-like flowers, white on the outside, pink or violet in the center. A single stalk can have as many as 60 flowers. The stalk also has leaves that at a glance resemble thorns. The flowers attract a few pollinators and ultimately produce dust-like seeds that disperse with the wind. Originally, it was believed that we humans spread the orchid by using mulch contaminated with pseudobulbs, but it's now found in a wide range of habitats, including rockland hammocks, pine rocklands, maritime hammocks, pine flatwoods, coastal strands, and cypress strands. In the few years since it was first discovered, the Chinese crown orchid has expanded its range as far north as Brevard County and west to Collier, Lee and Manatee counties, and south into the Keys. According to the Florida Exotic Pest Plant Council, it's now found in 13 Florida counties. The FLEPPC classified it as a Category II invasive — a sort of watch list for exotic plants that are rapidly spreading statewide — in 2013. 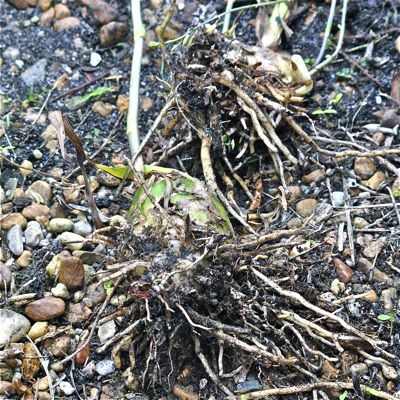 The problem the with Chinese crown orchid is its tendency to form large patches that block out other plants. The plant is not on any "prohibited" lists, however. We first found it growing in Lantana Scrub Natural Area, Palm Beach County, in June 2015 in an area covered with wood chips. We also found it growing in our Delray Beach backyard in January 2016 in an area that we keep mulched. Since then, we've seen it in multiple places throughout the region, always in areas that are mulched. Experts say Chinese crown orchid grows in places with colder temperatures than Florida, so it's anyone's guess how far north it will travel. Chinese crown orchid is a member of Orchidaceae, the orchid family.